Start the festive season with a fun and enjoyable day out with your friends and create some beautiful handmade Christmas presents or table decorations! 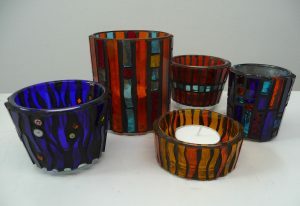 Students will use a mix of transparent mosaic and stained glass to create colourful and radiant festive tea-light holders. Tutor Joanna Kessel will guide students through the processes involved and you can anticipate making approx 3 pieces, depending on your dexterity and rate of working. Joanna trained at Edinburgh College of Art and the Royal College of Art. She runs Edinburgh Mosaic Studio and shows her contemporary mosaic artworks internationally, most recently in Spilimbergo, Italy and at London Design Fair. In 2010 Joanna received a Creative Scotland research and development award to study specialist mosaic techniques in Italy and she has returned on an annual basis. She is an enthusiastic teacher and runs a regular mosaic course programme from her studio in Edinburgh as well as residential mosaic courses in Italy. You can follow Joanna’s work via facebook or visit her website http://www.joannakessel.co.uk/ where you can click on a link to make contact and sign up to her eNewsletter. Numbers are limited to 8 – to ensure your place please book early. Cost £60, including materials, mulled wine and mince pies.